Disney is one of the world's best known and creative companies. It has consistently created value for over seventy years. Disney, like your organisation, is a synthesis of sophisticated production techniques and human creativity. Both Disney and your organisation are, to a degree, "problem solving organisations". That is, they need to be able to find practical solutions to the problems that face them, and quickly. 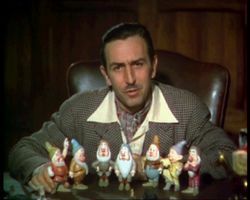 Walt Disney was one of the founding fathers of the Disney organisation and one of Walt Disney's abilities was to approach a problem from different mental perspectives. The Dreamer represents unrestrained creativity. The Dreamer is exemplified in the question "If we had no constraints, what would we love to do next?" The Realist is pragmatic and practical. The Realist asks, "How, in practice, could we make this work?" The Spoiler checks by wondering, "There is something wrong with this. What is wrong with this?" Walt could adopt any one of those roles. One animator said of him "You never knew which Walt was coming to your meeting". Walt Disney saw the creative dreamer as the starting point. He said: "Ideas excite me. I can never stand still. I must explore and experiment. I am never satisfied with my work. I resent limitations". "That's what I like about business, the certainty that there is always something bigger we could do... and the uncertainty of everything else!" "Our work must have a foundation of fact. We cannot do fantastic things unless we know what is real and what is not". "When we consider a project, we must really study it. We must know everything about it". "Our business will grow with technical advances. Should technological advance come to a stop, prepare our funeral. We need new tools and refinements." "Our success was built by hard work and enthusiasm, clarity of purpose, a devotion to our art, confidence in the future and above all, by a steady, day-by-day growth. We all studied our trade and learned everything we could." Disney could also be a critical thinker. He needed to be, because he knew his audience would see the errors. "He never spared feelings, because his interest was in the product. If a fellow went off on his own developing an idea that had not been approved, he was asking for trouble, and got it"
The spoiler critically evaluated the work of the realist and dreamer. "We had to become perfectionists"
"Our studio became more like a school than a business." Walt developed a philosophy that anyone who wants more success would do well to adopt. Walt said: "We were growing through self-criticism and experiment. Each year we could handle a wider range of material, attempt things we would not have dreamed of tackling a year before." "I claim that this is not genius, or even remarkable. It is the way people build a sound business of any kind, through sweat, intelligence and the love of the job." What would we see if it were finished? How specifically will we do this? What, broadly, are the steps? When does each step have to start? What legal implications are there? What would be the cost be if it did not work? What is the one thing you forgot to ask? How do you know this is a good idea? What would happen if we do nothing? The idea is to consult each of the three "mind sets" and evolve a creative, practical and critically validated plan of action. 1. Create three locations (three distinct areas set aside all in one room) and label them 'dreamer', 'spoiler' and 'realist'. 2. Name the outcome and step into the dreamer location. Visualise the outcome. Ask and answer the dreamer questions. 3. Step into the realist location. Refine the previous ideas, by asking and answering realist questions. 4. Step into the spoiler position. Question and critically analyse the problem. 5. Turn problems into questions and return to the dreamer and realist for solutions. 6. Repeat the cycle several times until the plan satisfies all three positions. You are faced with making decisions every day, and it is important to make the right one. We explore the different types of decisions you will face and some fantastic tools we have developed in order to help decision-making easier for you.